Past years, my hair have been falling out so badly. Therefor, I needed to find a natural remedy to reduce hair-fall. 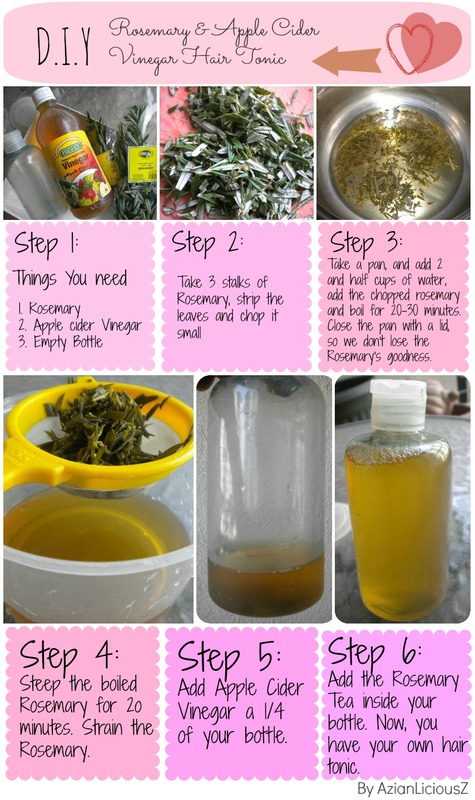 I have done my research online, and Rosemary seems to help. Rosemary, stimulate hair follicles and hair growth. Apparently, it slows down premature hair loss and grey hair and it gets rid of dandruff. As for Apple Cider Vinegar, it cleans up your hair follicle and cleans up the dirt that as accumulated over time, such as shampoo, hairsprays and gels. It promotes a proper pH balance to promote hair growth and a healthy scalp. I have created a DIY leave in Toner for my hair and I would like to share with you. Extra info: If you have a spray bottle would be better, since I didn’t have a spray bottle, I just used a normal bottle. Spritz it in your hair, after you have washed your hair and leave it to dry. Your hair feels glossier and shinier. For longer use, place the toner in the fridge, discard after 2 weeks. I loike how u did the step by step with picture.. Might try it out!!! Could you please share your results of using this to tonic? Hey Shehneela..i have been using it for 2 months now and I can see that my hair is growing out of my hair follicle, but ive been eating biotin as well, which promotes hair growth..it basically cleans my hair follicle, so tht my hair can growth through and not die off..hope this helps for you..